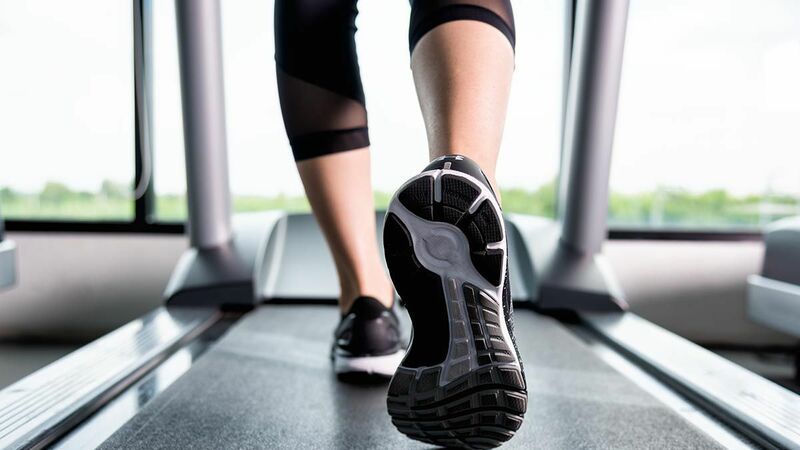 Because of the growing awareness of people on the importance of being physically fit and healthy, the popularity of treadmills has also increased. A lot of people also find it very convenient to not have to go to the gym or spend time outdoors to do some exercise. however, it is also a fact that buying your own treadmill for yourself is not a very practical choice, as treadmills are expensive. 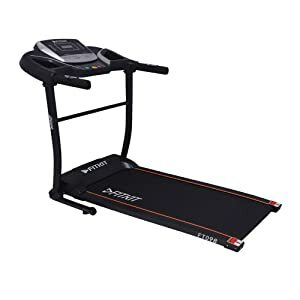 But if you know where and how to look for best affordable treadmills, you will definitely save a lot of money and have the convenience of doing workouts at home. Doctors always say that it is not necessary to go to the gym to keep your body fit. As a matter of fact, going jogging or walking for several minutes a day can surely benefit the body. And with your own treadmill at home, you will have no reason at all not to spend some time every day burning some of your fats. The only thing you should do is set the inclination and the speed of your treadmill, and you’re on your way to having a good and effective cardiovascular workout. 32 What To Look For Before Buying The Best Treadmills ? When it comes to treadmills, the Powermax Fitness TDM-125S is your best buddy in fitness and in health. This is not only the latest model of Powermax Fitness treadmill, but it is also the most advanced treadmill model that has almost everything you need. 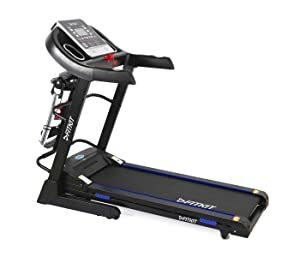 This product features a 2.0 HP DC Green efficient motor , 20 Built-In Workout Apps, 0.8 to 16.0 km/h QuickSpeed Control, 3 level manual Incline Control, Heart Rate Monitor, Smart run function , 5.5” Bright Blue LCD display, and a 49.6” x 16.9” running deck. It also comes with a SpaceSaver Design with EasyLift Assist and Built In Speakers with AUX/USB connection . It has a Compatible Music Port for iPhone or mp3 player and its maximum weight capacity is 110 kg. Fitkit FTK065 Motorized Treadmill is a reliable, high-quality, and user-friendly treadmill. The Fitkit FTK065 treadmill is packed with high quality components and capabilities that can be matched by only a few competitors. Fitkit FTK065 treadmill provides everything you’re looking for in a treadmill such as quality, durability, quiet operation, LCD display that shows speed, time, distance, heart rate and calories. It can reach maximum speed upto 14 km/hr . 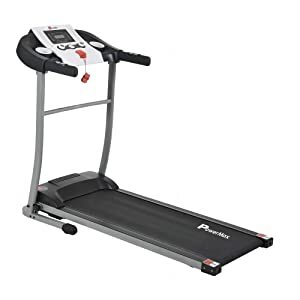 Fitkit FTK065 treadmill has an easy assist 90 degree folding deck design allows you to release the deck, step back and watch it unfold effortlessly. It has a 41″ x 14.17″ strong & durable running deck that provides you a capacious running environment equipped with transportation wheels and 1.75 HP DC motor. 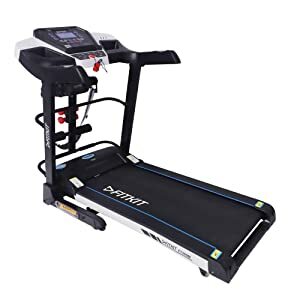 The Fitkit FT063 7 in 1 Motorized Treadmill has features like trainer workouts that are provided in the machine and a shock absorbing running belt that would make you feel comfortable whenever you use it. The shock absorbing running belt lessens the impact that you can feel from running or briskly walking in the sports equipment. The speed of the treadmill can be at a total of 1.0 to 14 km/hr and has 12 preset workout programs.The treadmill is using a DC motor that can run for 2.0 HP that would let you be pumped up during the entire workout. Fitkit FT063 7 in 1 treadmill comes with a maximum user weight of 120 kg and has a heart rate sensing feature. It has a 48″ x 16.53″ running surface and a large LCD display that shows speed, distance, calories, time and heart rate. The features of the product can also assure you that you would perfectly fit on the workout that you want to have. Excellent in all aspects of its construction, Powermax Fitness TDA-230M Motorized Treadmill meets all the criteria for being a best seller. Heavy motor, large belt and a series of intelligent systems for tracking user’s performance and friendly design – Powermax Fitness TDA-230M subscribes as a reliable treadmill for professional use. The powerful motor, which has a 3 years warranty, runs at 2.0 HP and it is also comprises 2” rollers. Despite its impressive technical specifications, Powermax Fitness TDA-230M treadmill is silent even when it works at full capabilities. The heavy duty motor can reach a speed up to 1.0 to 14 km/h, at 15 level of maximum auto inclination. The large belt 49.6″ x 16.5 ” is perfect even for persons up to 115 kg and moreover it features shock absorbers, which reduce the stress on joints and muscles in comparison with non-cushioned treadmills. Besides the usual workouts (speed, time, heart rate, distance and cardio) Powermax Fitness TDA-230M Motorized Treadmill features a series of 12 different preset programs depending on your profile as runner or particular goals. One can check permanently the status of its workout efficiency by reading on a 5.5” Bright Blue LCD display. Fitkit FT200 motorized treadmill is well regarded by most treadmill reviews as being one of the best treadmill out there. Not only is it ergonomic but it also gives the frame a lot more sturdiness and stability. This latest model offers an integrated iPod connector and USB power port for easy charging of your media devices. It has a LCD display that shows various activities like speed, time, distance, calories burned and heart rate. Fitkit FT200 motorized treadmill offers speed range upto 16 km/hr at 0-15% of auto inclination. Fitkit have always produced well sprung decks and this new model is no exception. However it does have a 48.8” x 16.5” (1240 x 420mm) running surface which gives you plenty of space to walk or run and shock absorbing running mat plus massager. It offers a 2.25 HP (4.5 HP Peak) motor and maximum user weight of 110 kg. The Powermax Fitness TDA-125 motorized treadmill is the name of a new revolution in the weight management and fitness industry that has been knocking at our doors. 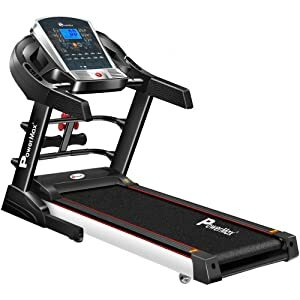 You must have heard about this treadmill because the Powermax Fitness TDA-125 is one of the most sought after, highest rated, and best treadmills on the market today. It has a dual shock absorber multi ply polyester running belt to reduce any negative impact on joints while using it, therefore feet, hips, ankles and knees love it being so at ease. The remarkably comfortable surface of this treadmill equipment also feels very enjoyable while walking and running. It has 12 set of pre-defined workouts programs, 2.0 horsepower (hp) DC motor and a large 49.6”x 16.5” running surface. 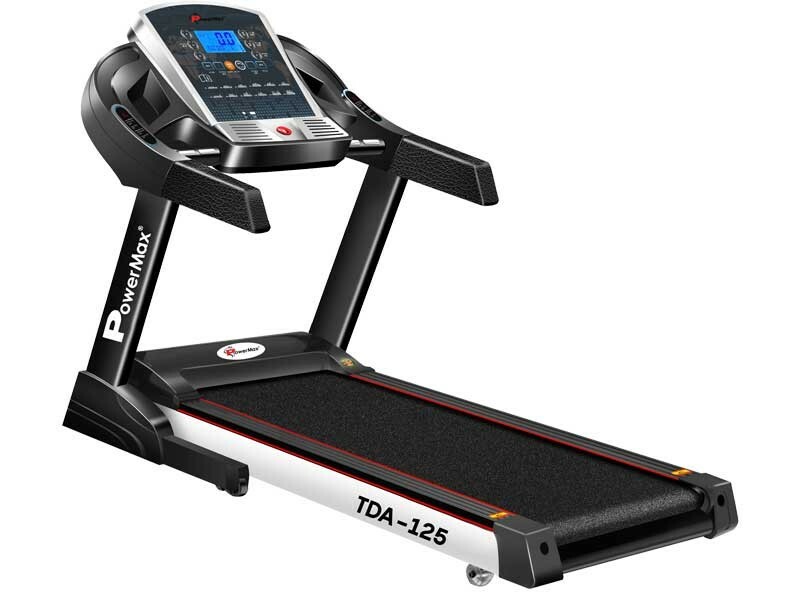 The most important thing about the Powermax Fitness TDA-125 is that it is specifically designed to move easily from one place to another. You can easily use it from the comfort of your own house to any other place you want it to be. Unlike other treadmills it has full digital readout. It offers one large 5.5″ Blue LCD display with multiple readouts like exact speed, time, heart rate, distance, calorie loss etc. Fitkit FT098 Motorized Treadmill is designed for persons upto 90 kg. Fitkitmaintains the high quality standard for which the company is known. Recommended for in-house use, Fitkit FT098 treadmill is ideal because of its folding system and easy storage. Also, referring to space, the belt dimensions are generous: 43″ x 15.75″, satisfying every performance runner. 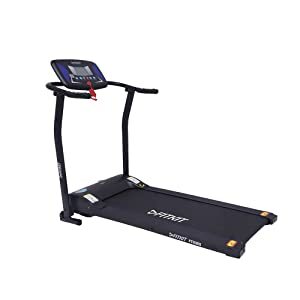 The running area is greater than for any other treadmill in this price category. The 1.5 HP motor offers a reliable service even for professional users or continuous usage. Also, in terms of performance, Fitkit FT098 offers suitable adjustments for heavy duty: 14.8 km/h maximum speed and 12 preset workout programs . Fitkit FT098 treadmill offers an LED that shows speed, time, distance traveled, calories, fat and heart rate . 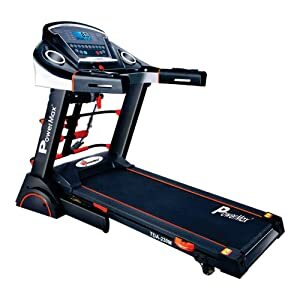 Fitkit gained its reputation as a very reliable treadmill manufacturer and the 3 Years Motor Warranty, 1 Year Parts and Labour Warranty & LifeTime Frame Warranty guarantees the quality that lays in Fitkit FT098 motorized treadmill. The Healthgenie 7in1 Motorized Treadmill is designed to meet the needs of various applications, from home use, to marathon training or gym practitioners. 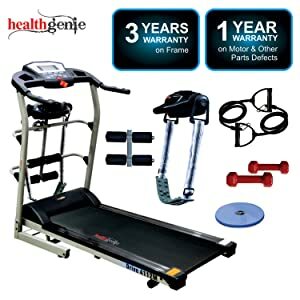 Healthgenie 4112M Treadmill is a reliable investment, knowing its motor sturdiness, convenient dimensions, handiness, additional features and good money value. At a first glance, Healthgenie 4112M Motorized Treadmill meets all the generic requirements: 2 level manual inclinaton, 14Km/hr maximum speed, integrated grip, massager, heart rate and pulse sensor. Also, you can personalize its preset programmes for efficient workout. The programmes are easily accessible via a large, 5″ LCD display which also facilitates the performances’ track. For those wanting convenience and to exercise lightly, you should look at the Fitkit FT100 Motorized Treadmill. 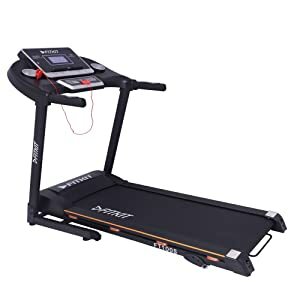 It is considered to be the best treadmill in the online market because it can give you a smooth and quiet workout even when you are using it on a moderate level. The product is designed to provide the function that is needed by people who want to get fit even in their homes. The product is also designed to give you the comfort that you need whenever you are using the product with the cushioning deck that would reduce the impact on the joints. Fitkit FT100 is one of the sports equipment that you should have for burning those excess calories that you have and it has a 3 level manual incline for keeping you active during the workout and 1.75 HP (3.25 HP peak) DC green motor. The Fitkit FT100 Motorized Treadmill is also designed to be a space saver as it can be kept anywhere in your house. You would definitely have the best treadmill out of this product because it has a 3-years motor warranty, Lifetime frame warranty, and 1-Year Parts warranty. When it comes to Powermax Fitness TDM-98, opinions are divided into a reliable and space saving treadmill. Sturdy, with a 1.5 HP DC motor , the Powermax Fitness TDM-98 is suitable for those who want to reach performance by training at home. Maintaing the usual specifications regarding the inclination and capacity (90 kg), the treadmill is equipped with a patented technology for controlling and adjusting speed from 1.0 to 10 km/hr. Its relatively reduced dimensions of 43.3″ X 15.75” are easily foldable to a verticle position, helping at the space-saving. Despite its small sized outline, Powermax Fitness TDM-98 motorized treadmill is useful for home use and the endurance of the composition raw material of the deck guarantees a reliable experience. Moreover, the running is smoothed by the 1.8 mm thick multi ply polyester which absorbs the shocks that the foot, heels or joints might feel. For keeping track of speed, time, distance, heart rate, and burned calories, the 5.5 inch LED display is continuously indicating the running performances, being easy to be set and read. 12 Pre-set programs & 3 target based modes. What To Look For Before Buying The Best Treadmills ? No matter whether you are a beginner to exercise treadmills, or are a seasoned keep fit buff, there is no doubt that a treadmill can be a really good investment. They are one of the best machines to not only help you to get into shape, but to stay at your optimum fitness level. There are literally hundreds of treadmills available to buy, all offering various options. So what are the most important things to look for when you are looking to buy a treadmill? you will be using this for all of the exercise routines, so it is important to locate one that is right for you. Most of the decks will have a roller each end which will help to operate the belt. They will all provide some type of shock absorbance, but the more expensive ones have much more cushioning which is far better if you aim to do lots of running. If you have an average stride then the minimum deck size should be around 20″ by 60″, if your stride is longer, then you will need to go for a treadmill with a larger deck running area. As this is what controls the whole machine you need to look at the horsepower of the motor. These will vary from 1.5 Hp up to around 3 Hp. Don’t consider anything less than this. Do bear in mind that the high the horsepower of the motor, the more expensive the treadmill will generally be. If it is just going to be used in the home, a 2 Hp motor should be good enough. Sometimes there can be too much information on the consoles, but you need to ensure you will have enough, The minimum will be a panel that shows the speed you are moving at, how far you have travelled and the time it is taking you.There are many more things that can be included in the console, but these are really a matter of personal choice. Metal frames are the most durable. You need to choose a frame that will cope with the amount of use you intend to give the treadmill. Consider safety features like automatic shut-off. If something gets tangled, you will be safe since the treadmill shuts off. Also, features that prevent children from using the treadmill is also a big plus. Treadmills can also cause accidents if not being used properly. Buying a treadmill is a quite a big investment, so always get the best one. You wouldn’t be sacrificing price for your health, so you shouldn’t also be when buying a treadmill. Treadmill exercise is the fastest growing fitness activity in the country. Treadmills are very convenient for busy people who just don’t have the time to go to the gym regularly, or even take a walk around the block. Treadmills are a great way to get into shape and burn fat. Do you know that walking and running have the lowest level of perceived exertion while burning the highest number of calories. Walking and running does wonders for maintaining bone mass because it is weight bearing and provides the additional benefit of impact at foot plant. More importantly, because it is so natural, walking is one exercise that you can stay with, see results and enjoy. Treadmills are known to be the most popular and most effective home exercise and fitness equipment with 33% of the sales and is capable of burning around 850 calories per hour. Treadmills are so popular these days because of the many benefits they provide. The most important treadmill benefit is it works by having you walk, run, or jog in your usual way. Another important benefit is treadmills tend to be less harsh on tendons and joints than other exercise machines and even other sports. Treadmills are great for these people because they can read, watch TV, or listen to music while they walk or run. Some treadmills even allow you to work on your laptop wile exercising. You can get the best treadmills workout regardless the weather. Rain or shine, snow or heat, you can still workout with your favorite treadmill. With cities getting more crowded, treadmills are immensely popular with those who prefer to exercise in the comfort of their homes. Treadmills are great for beginners because they require little coordination to use. However, treadmills do not come cheap. Treadmills start at approx $299 for a self powered one up to over $5000 for a motorised commercial type. Many treadmill users have sworn that their treadmill is one of the best investment as it keeps giving you more value for money every year. With the all-weather availability and anytime-convenience that treadmills can give, what other better way to invest in your health? Now that you know about the many treadmill benefits, before you go ahead and purchase your first treadmill, read about all you should know about buying treadmills. What are the features to look out for? Should you buy online? A treadmill is a big investment. It might not be a car. It certainly isn’t a house. 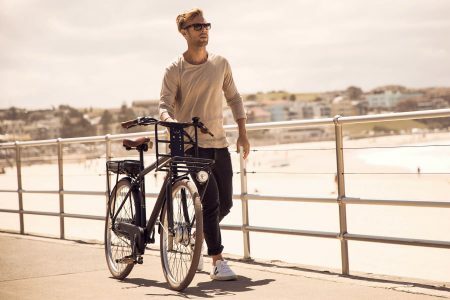 But you do spend around $800 to $1000 of your hard-earned money on a piece of metal that is supposed to help you burn down calories and generally stay healthy. Why would you waste your money on something that doesn’t work, or has very low shelf life? Read about the great tips on how to avoid bad buying practices. Even if you have already own a treadmill, are you giving it the best care possible so that it continues to work to keep you healthy? Read about the many great tips for caring your treadmill, and they will pay off in the long run!